Are you thinking about trying to teach your kid to read at home but clueless where to start? I felt that way, and am here to tell you that with this book, you can do it! Even with no experience. After using “Teach Your Child To Read In 100 Easy Lessons” with my 4.5 year old son, I’m sold it works! So many parents recommended it that I thought I’d give it a try. Plus, it tells you what to say (which we pretty much follow word for word). We went through the book very slowly, doing only half a lesson a day at times due to a short attention span. Now, a year later, my son loves to read to himself and it makes me happy to hear him giggle while he reads his joke books on the couch. If I can do it, so can you! Why use “Teach Your Child To Read In 100 Easy Lessons”? There are many great ways I’ve seen homeschool moms teach kids to read, but I’m going to show you why this book is working for us and thousands of other kids. First, when it comes to teaching reading, there are many other ways besides this book. So find one that you like. From books, to programs, to apps. There are a ton out there! Not sure if you are going to homeschool yet? Be sure to read my thoughts on the pros and cons of homeschooling. It has worked for tons of other early readers. I don’t have to prepare anything. It teaches phonics so kids learn to sound out words they don’t know. It’s easy to use once you get the hang of the first few lessons. All the stories in the book use words and sound combinations the kid’s know till that point. This keeps my son from getting frustrated about trying to read things he hasn’t learned yet. My motivation for teaching my boy to read early is that I want him to be able to read and explore books alone. I have a short video for you to see my son’s progress on lesson 58 if you are curious! What age do kid’s learn to read? A child can learn to read when they’re interested and when their attention span is long enough to last 15 minutes or so. Not every child will want to read at the same age. The beauty of doing this with your own kids is that you can do it anytime they are interested! Every kid will be a little different, but most kids should know letter sounds by age 5 or 6 and be doing some very basic reading/ recognizing some words and word patterns by kindergarten. By the end of this book, your child will be reading beginner level kid books! How do you know if your child is ready to read? Before a child reads, they are often doing “pre-reading”. I feel my goal is to get them to love reading, so if they are not into it, no pressure. My 4.5-year-old has been asking to read and pretending to read books, so those are important pre reading signs. His attention span is getting better too, where he can focus around 15 minutes which is about half a lesson and long enough to make daily reading progress. Look for these signs to see if they may be able to start reading soon. Retelling stories while flipping through the book. Learning which direction a book opens. Sitting still on your lap while you read several books to them. Recognizing their name on paper. They point to letters or words and make guesses at what is says. They notice letters on cereal boxes and signs. Pretend reading (which means they understand the symbols mean words). Letter name recognition (some kids learn this before or after learning letter sounds). My goal is NOT to have him reading before all his peers. It’s for him to love books and to be able to pick one up on his own when he’s ready and want to read it. And that means LOTS of being read to! I’ve seen my husband’s two sisters use this book successfully so far on 5 kiddos, and I’ve met several mom friends who have also used it for their boys around 4/5 years old (preschool/early kindergarten age). This book has also won awards for how effective it is. So, I was convinced to give it a shot! Plus with no prep and 3 kids under 5, sign me up. To be honest, this teaching my kid to read thing intimidated me A LOT because I honestly didn’t know how or where to start. But, this book literally provides you what to say word for word and how to teach! Plus it tells me when it’s my turn to speak and when it’s his. Step 1. Buy the book. Step 2. Read lesson 1 alone with no distraction, to get a feel of how it works. Step 3. Show your kid a prize they get when they do a reading lesson (or for us, half a lesson). Step 4. Have your kid sit next to you after explaining they are going to start learning sounds, yay! Step 5. Start lesson 1. You will probably be a little confused as to how this works at this point. Lesson two is easier because you get used to “the format”. We broke our lessons in half a lot too. Step 6. Do a lesson word for word every day till your child is reading! We liked doing a short recap of what we learned the day before too. The book comes with short stories appropriate for the lesson and pics with each story. Step 7. Go to the library and get level 1 reading books to practice when you finish this book! Forgetting it’s fine to be silly and get off topic a bit so it became a bore and a chore. Failing to come with LOTS of patience. The book can teach a kid how to read but it can’t make them love to read. That’s my job! Skipping days or weeks at a time. We backtracked a lot of times which made it harder for him. At first I thought we could never stray from the exact wording in the book (it’s encouraged not to). I would get frustrated when my son was being a normal silly kid or slumping all over the couch or would keep getting it wrong or just start guessing. These are pretty normal things! 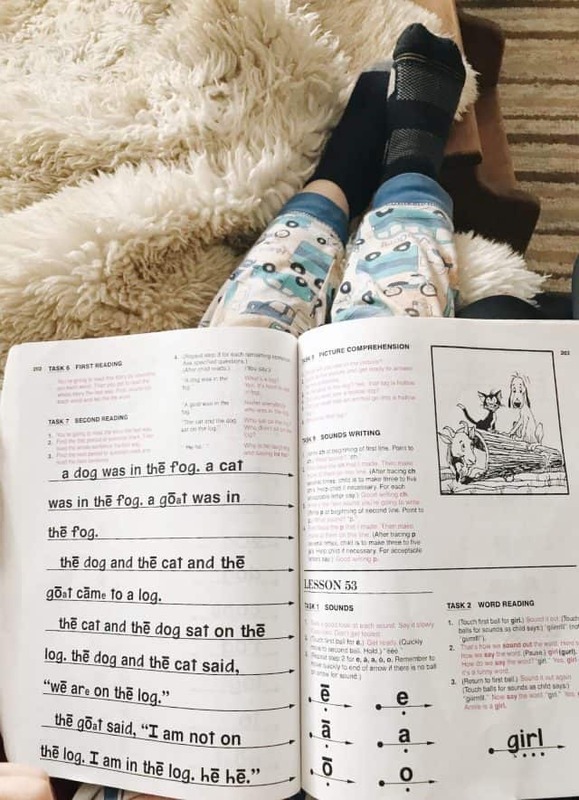 How to teach reading at home is a big thing to tackle, but you can do it, and you do not need to be a certified teacher to do so. How to make learning to read fun! Cheering or high fives for them when they get it right! Talk about the words and sounds and get off course now and then! For instance we will read “the fat cat” and my son will want to tell me about a cat that got into the garbage outside. That’s fine with me, and I think is the beginning of reading comprehension! Stop if it’s not going well, and come back to it later. You will both enjoy it more that way, which is half the battle. Give a treat when when you finish a lesson. We used to do a piece of candy, but now do a show which is my son’s biggest motivation. Do half lessons if needed, but do something every day. That could be a simple review of sounds. Draw a picture of the words you learned. Point out what signs say on walks, at the grocery store, or at the park. Start going to the library if you haven’t yet and ask the librarian where beginner books are. Also buy or checkout books on topics they love. My son gets excited about books about diggers, volcanos, bugs, where as my daughter chooses way different topics. Do kids learn to read and write at the same time? No, which is one reason why we were able to start reading before writing. “Teach Your Child To Read In 100 Easy Lessons” has a mini writing lesson for each day too, but we skipped that part when we first started this book when my son was 4.5 (preschool age) . His attention span was shot by the end, and he didn’t have an interest in writing yet. And that’s ok! That’s the beauty of it, you can come back to it later. He wasn’t ready because he got frustrated too soon. So I put that off for a while and waited till he was literally asking me how to draw some of the sounds (aka letters) we were learning. Can kids learn to read before they can recognize the alphabet? Yes! This is a question I get from moms teaching preschool at home that want to try out early reading when their kids haven’t learned all their letter names just yet. This is how we started my son and it was no problem. Our book first calls them sounds actually, as that’s the first thing that’s important to read, not just knowing the names of the letters. You do not need to know the letter names to be able to read! The book does also teach the names of the “sounds” towards the last third of the book though. If you are starting to teach reading in kindergarten, then likely your child already knows their letter names. Related post: 24 easy toddler crafts from a non-crafty mom. We tried it when he was 3 just for fun because that’s how old my husband’s little brother was when he started this book successfully. It was WAY too early for us. My son was too distracted, couldn’t sit still, and didn’t show any interest. He’d way rather just go play, which is normal and ok at 3! It was more an experiment to see if he was ready at all. When he turned 4 he got frustrated that he couldn’t read books. But by 4.5 he was definitely ready to sit still and do this book. While I know this is possible one on one at preschool age, most parents want to know how to teach reading in kindergarten. Does the book teach about writing letters? This book has a writing component within some of the lessons, but I skipped those. By the end of the reading lesson our brains were fried and he needed to go wiggle and play. If you think you’re ready to start working on some letters though, great! Here’s how we are teaching my 5.5 year old to write his letters. I spent a good hour just looking at lesson 1 and how it was formatted. That was really helpful so that when I sat down with a squirmy boy for 10-15 minutes the time was used efficiently and I wasn’t trying to figure out how the book works. Don’t skip this part or you will be a little unsure of how to do it! Every word is set up for “the teacher” to say to the child. So no matter if my hubby does the lesson or me, we are saying the exact same words as we walk him through a lesson. How is “Teach Your Child To Read In 100 Easy Lessons” formatted? This book divides lessons into red and black words. Any words in red are for the parent to read out loud, which tell the child what to do. The black words are instructions for the parent so you know what to do. The beginning focuses on a ton of individual sounds in giant print (up to lesson 10 or so). A letter gets associated with a sound. And eventually, sounds get combined to make bigger sounds, like “a” and “ar”. It’s so cute to see the lightbulb go on in his brain when he recognizes a word after learning a sound, like “art”! In each lesson the child “sounds it out”, and “says it fast”. As the teacher, I tell my child to “sound it out” while touching underneath each letter. (after I’ve modeled how to). Later as sounds combine to form words he slides his finger under each letter and sounds out the individual sounds. For example the sound “r” is sounded out “rrrrr”. Then he has to say it fast. Same for words. For example, when seeing the word “ram” for the first time he sounded out “rrraaammm” while sliding his finger under each sound. Then he had to say it fast like this “ram”. There’s a picture for each story, which kids LOVE! Later on in the book, it will ask you to do everything twice and ask questions after each sentence to work on comprehension. There’s an optional writing lesson if you wish to try. Everything gets sounded out. This video is awesome if you want to see the book in use by a mom teaching. Here are our updates at different parts of this book! Follow along to see that it works. I’ve also listed what’s changing in the book as we go, what they are able to read or recognize, and struggles we’ve had in each section. Keep reading if you would like to see for yourself if this book works and to see a short video of my son reading solo on lesson 58. We often do half a lesson a day which also works well or do two half lessons each day. Just so long as it’s every day. But how cool that from the day you start, your kid could be reading in 3-6 months! This book works and I’m sold! It builds well on previous lessons, and we do one 10-15 minute chunk every day. Sometimes I’ll review the lesson from the previous day and get halfway through a new lesson if he’s not ready to move on. At lesson 30, he is sounding out “An ant can eat a seed. That seed is in the mud.” Then I ask him questions about the sentence like “where is the ant?” We also talk about the picture next to it of an ant playing in the mud. Now at lesson 30 he can also identify the whole word if I ask him to spot it. Every lesson there is a story to go along with a picture. The stories started getting noticeably longer around lesson 43, with around 8 or 9 lines to read instead of 4 or 5. He is supposed to read each story twice, so it started getting WAY too long for his attention span. To solve that I have him read it only one time (which is sounding out each word and then saying it fast before going to the next word). Or sometimes we trade off sentences which sped it up and made it more enjoyable for him. Then later we could come back and read it again or start there the next day. I started to notice that he was attempting to “read the story the fast way” by pointing to each word and saying it, rather than sounding out each word and then saying the word. Then, starting lesson 55 just a few lessons after I thought that, the directions changed to have him read it the fast way the first time. When he came to a word he couldn’t read the fast way then he was supposed to sound it out. The timing was near perfect because he naturally began to just sound out words in his head instead. Some noticeable changes have happened at this point. The stories are much longer and the font is smaller. My son always points out the letters are shrinking :-). But he is able to read at a little faster pace. He is learning new sounds like “ing” and “oo” and “ar”. There are longer words like “sitting”, “fishing”, “swimming”, “inside”, and “under” to name a few. He knows when to say a hard sounding vowel vs soft vowel because of the symbol on the word still. For example the word “gave” has a line over the a, but the word “sat” does not. I’ve found it is super important to follow the book asking him the questions about each story when we read it, or he can tend to not comprehend all the sentences. Also when he tries guessing words, we either take a break or I’ll help him with the first sound as a clue. The book is now matching sounds to the letter names! The alphabet is written largely and we pointed to a-j saying the sounds. (We sung them, as he knows the song already). I was pretty sure he wouldn’t remember the names of any, except he did remember a few! In the next lesson (74), they reviewed letter names a-j and introduced the names k-u. Then, for the first time the book had him point to a few words and say each letter name. A few were o-l-d, t-o-l-d, c-o-r-n, and b-o-r-n. While he got a lot wrong, I feel something like this just takes a ton of practice when learning how to read and eventually the brain remembers. This is honestly the first place that I have felt like we need to go backwards in the book and make reading fun again. Or just take it much slower. They are introducing taking out hints (so lines over letters) so that words look normal. He has really struggled with that and has starting guessing more. He’s having a hard time knowing which sound to say. For instance the word “road” will confuse him because there isn’t a line over the o and the a is not smaller in size like it was, which used to be a hint not to say it. I’ll update this with how it goes. I can also say that we took about 4-5 days off around this time and that we saw major regression. I see that kids really need the short spirt of time constantly or they do forget in these early stages! We can just back up a few lessons. We went back about 10 lessons when my son was having a hard time (see last update), and it worked wonders! He needed more repetition reading, and once we got back to the point where they read without the clues, he was able to recognize the words much more easily without them. To combat the overwhelm of the long stories, we took a blank piece of paper to cover the whole story except the one line he was reading. This is my best tip for this update! They also just introduced capital letters. We made it! Ok, if you’ve read this far, I’m impressed. And, maybe you noticed that we actually took about a year to finish this book! My son is now reading very basic level one books from the library and I’m so proud of him! At one point since my last update after lesson 80, we backed up all the way to lesson 50 again. I know. I wasn’t consistent and sometimes took a month off here and weeks off there. But this goes to show you that it’s possible to drop off and pick back up again! Why is comparing so easy to do and dumb at the same time?! Some learn fast, some learn later when their attention span is better. I figure when my kids seem interested, and I’m willing to sit down and do this every single day, then it will happen! I have felt self-imposed pressure to teach my boy to read even before he was ready. And as sad as that is to admit, it’s true. I’m sure everyone has that about something when it comes to their kids. The beauty of homeschooling is that you can start when your child seems ready. What makes you want to teach your child to read? Leave a comment and I’ll respond! Love this! With my girls (6,3 and 1) I just always make an effort to constantly shove a book in their hands- it works. Books and reading is the biggest pastime in our house. Thank you! Yes, I should do that more even! It’s capable of being the best form of entertainment and imagination! I’ve never heard of this book, so interesting! 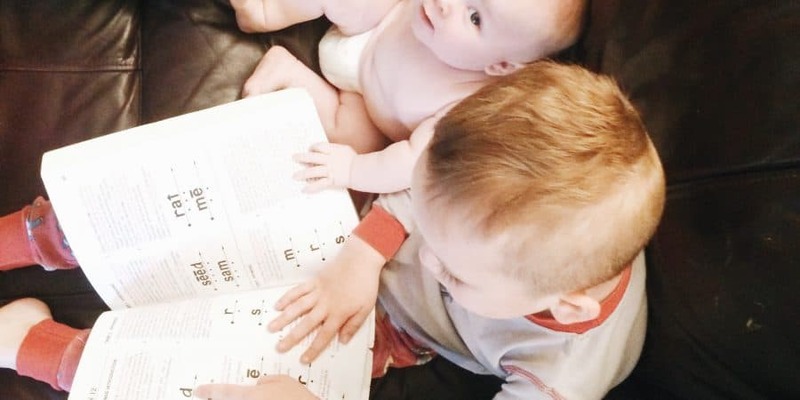 I was a kindergarten teacher before I became a SAHM so I completely get how daunting it can be to teach children how to read. I can’t wat for a progress report in a few weeks or months! Good luck! Thanks so much! You probably have some good tips I need to hear! I’ll update this how its going in a month or so. I found this book a couple of years ago. She reads chapter books and is in Horrid Henry now. She can write and spell phonetically. Wow thank you for sharing! That is incredible. It is amazing to see that some kids are ready to read earlier than others and that this book made it possible for you to do that with her! So inspired! I have used this book for over 30 years and have had great success with many children over the years. Wow! This is great! Did your son know letter sounds and beginning reading before you started this? I’m amazed how well he was reading in lesson 58 video! I will be giving this book a try! Thanks Melissa. My son didn’t know any letter sounds prior to starting this book, and we had not yet learned any letter names at this point either. I didn’t realize that kids could learn to read before actually knowing the names of the letters! Usually they learn it the other way around at school. While the first few lessons of this book were hard to figure out, it was a great tool for us as soon as we got the hang of it. I’d love to know how it’s going for you guys in a few months! I taught both of my sons to read using this book. They are now 27 years old and 24 years old. I recently purchased a copy of it for $3.00 at a consignment so I can teach my 3 year old grandson once he’s showing signs of being ready. Thanks for sharing all of your experiences with homeschooling. Thanks for sharing, and that’s so awesome that you had a good experience!